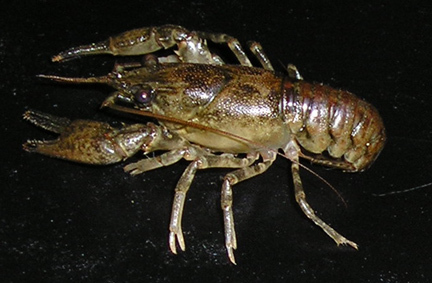 Adult Size: 3.5 - 4"
Diet: Like most crayfish, it will eat whatever is available to it. However, this species shows more inclination towards meat based foods when given an option. Breeding: Will mate and breed readily in captivity, but requires a temperature change to trigger the female into producing a berry. Temperament: Aggressive. Warning: Despite it's rather small size, this species' claws are extremely powerful. And it is quite willing to give you a painful nip when caught, handled, etc. Behavior in Captivity: Will tolerate being kept in small groups, when provided with adequate housing and food. You will observe many squabbles until an order of dominance is established. This species prefers silty and muddy sediment to burrow into, often seen burrowing under rocks and branches/logs/etc. This should be recreated in the aquarium, or this species will start rearranging your tank to create things to dig underneath. It will also become more aggressive as it becomes agitated and stressed from not being able to do so. Tankmates should be chosen carefully. Small fish, snails and shrimp are likely to become a tasty snack. 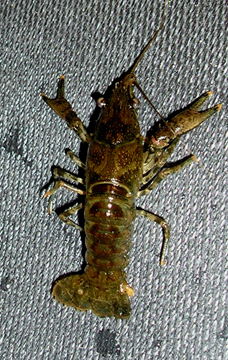 Larger fish like catfish, plecos, barbs may be nipped but are not likely to be caught by this species.